Why do we crave sugar? The main natural source of sugar is fruit. Thousands of years ago, vegetables were abundant, and fruits were scarce by comparison. Vegetables carry little energy compared to fruits, and primates who consumed the most calories were the ones best able to stave off starvation, pass on their genes. Primates who ate the most fruit were best positioned to win the evolutionary battle. Humans evolved to crave fruits precisely because these foods are so healthy in the small amounts that were available to us. Our physiology hasn’t changed much in the years since, but our natural desire for sugar has met an unfortunate problem – fruit, which should have been consumed in moderation can now be produced in abundance and is available any time. Some of us can eat a little sugar and stop, satisfying our craving without drifting from moderate consumption. 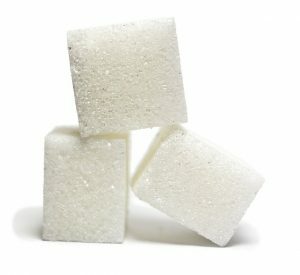 For those who are triggered to eat more when they consume a little, is cutting out sugar completely the only option? Before you go to that extreme, consider these tips for managing your sugar cravings. Drink water. As we age, we often think that we are hungry when, in fact, we are thirsty. If you feel a craving coming on, have a big glass of water before reaching for the jelly beans. Eat natural sugars. Having a piece of fruit can curb your sugar cravings while offering nutritional benefits. Oranges, apples, grapes, and dates are in season right now. Dark chocolate that contains more than 70% cocoa is also a great way to feed your sugar craving (in moderation!) and give you an amazing boost of antioxidants. Eat more protein. Eating protein will help you feel more satisfied, and the satiating effect of protein is a key player in weight loss and maintenance. Chew gum! Chewing gum can be a great way to control your sugar cravings. Gum or mints made with artificial sweeteners taste sweet but contain a minimal number of calories and no sugar. Some studies have found that chewing gum could help control hunger, cravings, and the intake of carb-heavy foods later in the day. Chewing gum after a meal is also good for your teeth.